Do you still have some students that struggle with basic addition? Then this product may be what you are looking for! 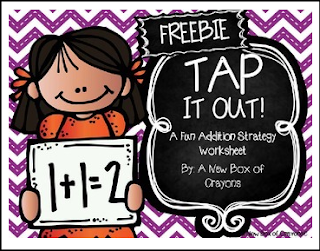 TAP IT OUT is an addition strategy I developed in my classroom. I have found it to help those students who still rely heavily on their fingers to help them add or subtract. TAP IT OUT consists of the student tapping a visual "TAP" sign while saying the larger number from an addition problem. Once they have said and tapped the larger number they are able to represent the smaller number using their fingers or by using mental math! It has been a huge life-saver for my kiddos! This freebie is a taste of what will be offered in my "TAP IT OUT!" product which will include "TAP" spots for your students along with many other activities to do with your students! I would love to hear your feedback on this product!